More power. With nearly double the power of its predecessor, the MX-5000 time to recovery increases production rates and throughput. Improved ergonomics. A new Metcal Advanced™ Hand-piece for soldering and rework is carefully designed to decrease operator fatigue and enhance the operator manual dexterity resulting in productivity gains. Greater process control. SmartHeat® Technology in every MX-5000 means that soldering and rework are always performed at safe, controlled temperatures. 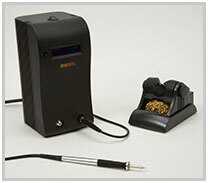 Metcal users know that moderate fixed temperatures, where power is varied, provide the best assurance for a well controlled soldering and rework process.